The emphasis is on court movement, basic stroke technique and match play. Players learn to move up and back along the baseline, develop more advanced serve and return techniques and practice hitting balls at the three different contact points. No more than 8 players per instructor. Players need to bring a full sized racquet and a water bottle or jug. Players should wear shorts/skirts with pockets for balls and tennis court shoes with non-marking soles. 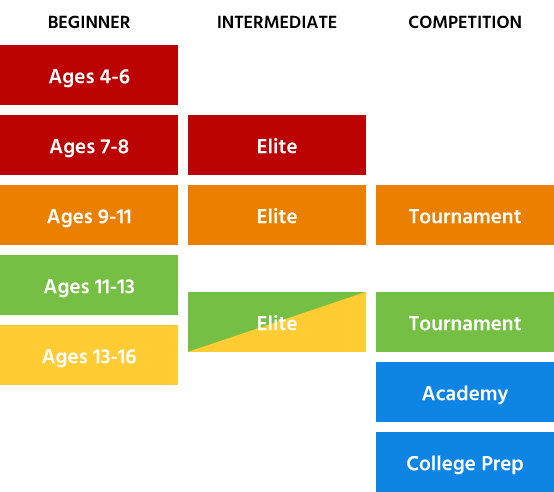 Green Level is for players who are 11-13 years old, or players who have mastered the Orange Level Competencies as determined by the coaching staff. Players learn on a 60 ft. court with green compression balls and a 27″(adult sized) racquet. Classes meet once or twice a week. No more than 8 players per instructor. The emphasis is on court movement, basic stroke technique and match play. The program includes a once-a-week class, match practice on Sunday afternoons at 3:00 pm during the school year. We have Green Level, Green/Yellow Elite, and Tournament Green Level. Elite and Tournament Level are by invitation only. Players need to bring a tennis racquet and a water bottle/jug to every class. Players should wear skirt/shorts with pockets to hold balls, a hat/visor and tennis shoes with non-marking soles. Players can register online or in the pro shop. See the link below for online registration. Our school year program features 8 week sessions for afternoon and Saturday classes. Classes start the first week of school and continue through the end of May. Program includes Sunday Match Day at 3:00 pm for all registered players. Players can register online or in the pro shop. Online registration requires setting up a family account with the tennis center. Our Summer Camps/Classes feature week long morning summer camps and once a week evening/Saturday classes. Players can register in the pro shop or online. Online registration requires setting up a family account with the tennis center. Summer Camps run Monday-Friday; Weekly Classes are offered on Tuesdays, Thursdays and Saturdays. Weekly Classes taught 5:30-6:30 pm Tuesdays/Wednesdays/Thursdays or 10:30-11:30 am on Saturdays, starting August 20 through the end of the school year. Weekly Classes from 5:30-7:00 pm Tuesdays/Wednesdays/Thursdays or 10:30-12 noon on Saturdays, starting August 20. Summer Camps are available every week throughout the summer Monday-Friday 9 am-12 noon. Summer Classes are taught Tuesday/Thursday at 6 pm and Saturday mornings. To create up a new member account with us, click on the button below and fill out a short form. We will create an account on your behalf, and then you may log in and register for classes and pay as well. Southlake Tennis Academy is a skills based program that focuses on age appropriate development following the USTA Competencies for Green Level. Learn more about memberships at STC and register an account.